For 88 years a small town has pantomimed the story of Christ in a ‘unique’ construction of Jerusalem built into an Oklahoma Buffalo reserve. It’s real-life Christopher Guest meets Fellini in a comedic, poignant, cinematic ‘hybrid’ documentary chronicling a 300-strong amateur cast, a 6-hour production, and Zack, the venerable paperboy-come-Jesus actor who’s secret threatens to de-rail the entire show. More details at http://www.deliberatefilms.com/#!feature-films/cwzt and the link below. 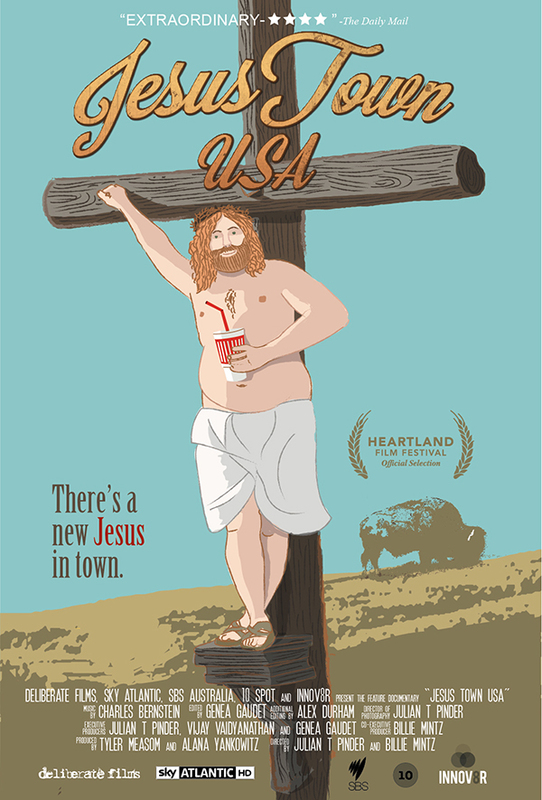 Read more about… Movie poster for the documentary “Jesus Town USA” by Deliberate Films. Here's what people have to say about my work: "whimsical" "wonderfully weird" "great work" "charming style" "childlike view" "very trade and fun" "love your animal characters" "cu… Show more. Send a message directly to David Barneda. PRINT, CMYK, The Society of Illustrators of Los Angeles, The Society of Illustrators of New York, American Illustration Tribute, Black Book ‘s Raw 50. . . Here's what people have to say about my work: "whimsical" "wonderfully weird" "great work" "charming style" "childlike view" "very trade and fun" "love your animal characters" "cute" "wonderful" "WOW! WOW! WOW!" "I am all smiles with this one." "sweet imagination" "terrific" "fantastic""fun characters""lively art""really wonderful exaggerated imagination""really appealing style + sense of humor""great perspectives, use of color & texture. ""incredible work""your line drawings are charming. ""really great work!! ""Cute picture and fun idea! ""wonderful""I love your work. ""the stuff on your website is phenomenal! Beautiful, rich illustrations with fun, engaging concepts. Some of the best stuff I've seen in a while." "terrific""refreshing"
Awards: PRINT, CMYK, The Society of Illustrators of Los Angeles, The Society of Illustrators of New York, American Illustration Tribute, Black Book ‘s Raw 50. . .